He once held the NBA record for consecutive games played. RIP. 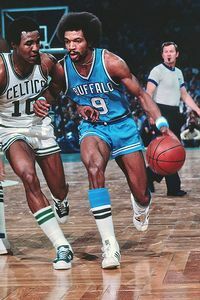 Randy Smith, a blindingly fast All-Star with the Buffalo Braves in the 1970s who once held the NBA record for consecutive games, died while working out on a treadmill. He was 60. He had a massive heart attack Thursday while exercising at the Connecticut casino where he worked, son-in-law Lekan Bashua told The Associated Press on Friday. Smith was pronounced dead at William W. Backus Hospital in Norwich. The Mohegan Sun Casino declined to comment on circumstances surrounding the death, citing medical confidentiality laws. Jack Ramsay, Smith’s coach in Buffalo, called the 6-foot-3 guard the best athlete he ever coached. Smith was drafted by the Braves in the seventh round in 1971 and averaged more than 13 points in his rookie season. He went on to play 13 years in the NBA and appeared in 906 consecutive games from 1972-83. His mark was broken by A.C. Green in 1997. “He played hurt, gave it 100 percent and took pride in that,” said Durie Burns, a college teammate of Smith’s at Buffalo State. Smith was a good shooter and great jumper who wowed fans with reverse dunks. He was one of the most popular players in Braves history, and in teaming with scoring champion Bob McAdoo he helped make the Braves under Ramsay one of the league’s exciting clubs. Smith spent seven seasons with the Braves before the franchise moved to San Diego. He also played for Cleveland, New York and Atlanta and retired in 1983. He averaged 16.7 points, 3.7 rebounds and 4.6 assists for his career. In one stretch, he averaged more than 20 points for four straight seasons. He finished with 16,262 points. Lakers assistant coach Jim Cleamons played against Smith and remembered just how versatile a player he was. Snyder said Smith made an immediate impression as a rookie during the Braves’ summer practices. Smith usually guarded the opposing team’s top player. Smith is still remembered in Buffalo, where an inner-city youth basketball program is named after him. He also excelled at soccer and track at Buffalo State and was inducted into the Greater Buffalo Sports Hall of Fame in 1992. After his retirement, Smith worked as a host and greeter for the Mohegan Sun Casino.